A third of your pint now goes to the Government in Duty and VAT – on average that is now £1 of the cost of your pint down the pub. Beer tax goes up automatically by 2% above inflation every year – known as the Beer Duty Escalator – and has raised beer tax by 42% since 2008. It’s time above inflation increases stopped. 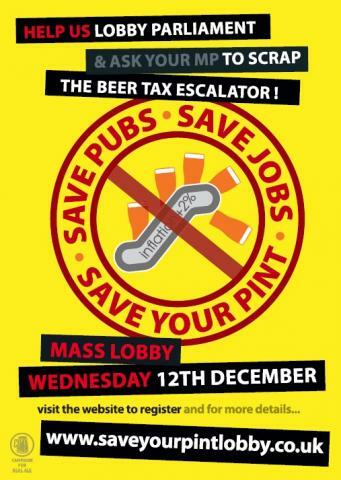 Join your fellow CAMRA members and other beer lovers from across the UK to voice your anger at this added pressure to already hard pressed pubs and tell your MP to support your local. Colchester and North East Essex Branch members will meet at 11:00am at the Emmanuel Centre in Westminster, before taking the short walk to Parliament.